SEO Site Checkup aims to make search engine optimisation, otherwise known as SEO, very easy. They provide simple, professional-quality SEO analysis and critical SEO monitoring for websites. By making their tools intuitive and easy to understand, SEO Site Checkup has helped thousands of small-business owners, webmasters and Search Engine Optimisation professionals improve their online presence. SEO Site Checkup is a dedicated team of professionals and webmasters with over 15 years of experience in the industry. They’ve seen how algorithms, penalties, and factors have evolved since the early days of search. As professionals and site owners, they know first-hand where webmasters need to focus and spend their time. To help search engines better understand a website’s intended topic or niche. Improve a website’s user experience and credibility (through relevant backlinks) to validate the site’s value to search engines. Improve a website’s user experience and credibility (through relevant backlinks) to validate the site’s value to search engines. 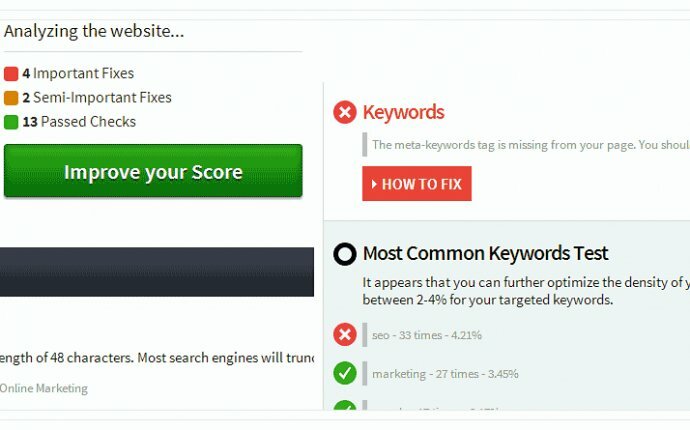 The site checkup offers an easy-to-understand and comprehensive set of tools to help you understand your website from a search engine’s perspective. In just a matter of few seconds and a couple of clicks, you can see how a search engine may interpret your site. Thier reports also let you know of any problems or technical shortcomings. They offer an easy-to-understand and comprehensive set of tools to help you understand your website from a search engine’s perspective. In just a matter of few seconds and a couple of clicks, you can see how a search engine may interpret your site. The SEO reports also let you know of any problems or technical shortcomings on your website that may be hurting your search engine rankings. They are proud that their reports focus on the latest search trends and factors. For example, a website’s loading speed is a relatively newer search engine ranking factor. their toolbox covers all such analysis to help you compete and succeed in the modern digital marketing world. They also understand that SEO is one of the most dynamic fields in the online business world. It constantly evolves with new updates, algorithms, and ranking factors. You may have already heard about Google Panda, Google Penguin, and Google Hummingbird updates. SEO Site Checkup’s site is constantly updated to reflect the latest changes and factors in search engine algorithms.